OMG OMG OMG THIS IS TODAY!!!!!!!! 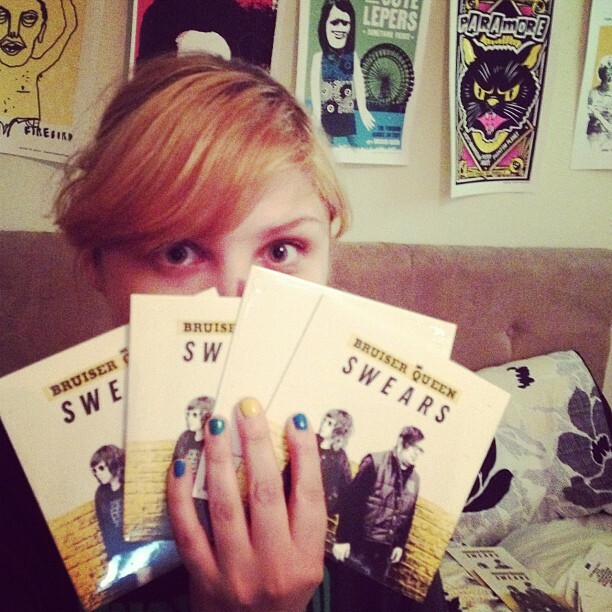 Come out and get your copy of "Swears" Tonight! And Beers! And High Fives! Morgan Nusbaum of Bruiser Queen - "A Girl Like Me"
In case you missed it, last night we made a quick stop in Kansas City, MO. Morgan treated some lucky park-sitters at the 18 Broadway Urban Garden to the sweet sounds of an acoustic version of a new BQ tune. Enjoy! The full release of "Swears" is right around the corner, but for now you can check out 7(!) tracks from it over at our bandcamp page - including the single "I'm Yours." PLUS!! Download a FREE track from the album - "Old Man Winter" - from our friends at Chevy Music Showcase on our Artist Profile Page.